Absent From The Body | Is Heaven For Real? and that an immortal soul leaves the body to face an immediate reward or punishment. If this is the true meaning of Paul's words, we are faced with some serious inconsistencies within the epistles. Let us examine the verses in 2 Corinthians 5:1-8 and discover what Paul actually did teach on this crucial subject. In order to get the picture clearly in mind, let us review the verses point by point. With the subject fully before us, let us determine the meaning of the terms Paul uses in the text. What does he mean by the “earthly house” and the “heavenly house”? By being “clothed upon” and “unclothed”? By “mortality” being “swallowed up of life”? 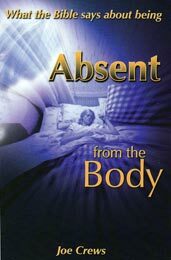 By being “absent from the body” and “present with the Lord”? The apostle answers all of these questions for us. In verse 6, he defines “our earthly house” as being “at home in the body.” The chief characteristic of this house is that it may be “dissolved.” In other words, it is mortal. This earthly house is, therefore, our mortal body or our present mortal condition. This fact appears too obvious for further comment. that awaits the redeemed beyond the resurrection. Here is where the greatest misunderstanding enters the picture. Some have thought that the “house from heaven” is put on at the moment of death. But the apostle clearly spells out the TIME when he will put on immortality. The comparison proves that this clothing from heaven takes place at the “redemption of the body.” Paul adds the final clarification in 1 Corinthians 15:5 1-53 when he again describes the TIME this change takes place: “…we shall all be changed, In a moment, in the twinkling of an eye, at the last trump… this mortal must put on immortality.” In other words, even though death should dissolve this mortal body, Paul makes it very clear that we do not put on the house from heaven (immortality) until the coming of Jesus and the redemption of the body. This is also established by the repeated references to the “naked” or “unclothed” state. What is meant by the term “unclothed”? Notice that Paul specifically declared that he did not desire to be naked or unclothed. We can be certain, then, that the unclothed state did not involve being with the Lord, since Paul did not desire it. In fact, the apostle made reference to being clothed with only two houses, the earthly and heavenly. In the unclothed state, he was neither in the earthly body nor clothed with the heavenly. That leaves only one possible explanation. To be “unclothed” or “naked” is the condition of death that is the interlude between the dissolving of the earthly house and putting on the heavenly. takes place? It is in the glorified resurrection bodies that the righteous dwell with God for eternity. This would involve those souls leaving the “house eternal in the heavens” which they inhabited at death, and going into the redeemed bodies at the resurrection. Then what happens to the house they vacated? Are the saints to have “houses to rent”? Moreover, this view introduces something that Paul never mentioned; for here we have THREE HOUSES, but Paul’s language allows for only TWO. And one would have to be abandoned according to the popular view. Would it stand abandoned and fall into ruin? All this is unscriptural and absurd. Such a view is an impossibility. The fact is that Paul is not talking here about the soul at all. He does not even once mention the soul in the passage or its context. He is simply contrasting the present life with the far more glorious life to come in heaven. He did not look forward to the sleep of death (being “unclothed”) when he would not be with the Lord, but he did long for the redemption of the body when he would be clothed with the “house eternal in the heavens.” While still in this life he would be clothed with a mortal body; and after mortality is “swallowed up of life,” he would have a heavenly, immortal body. But whether in the earthly tabernacles or house from heaven he would still have a body. Nowhere does Paul separate a soul from the body. It is either a body on this earth and being absent from the Lord, or it is a redeemed body in heaven and being present with the Lord. Here is further positive proof that Paul was referring to the resurrection as the TIME to put on that eternal house. To both the Corinthians and the Romans, Paul emphasized that the Spirit was a pledge that they would be clothed with immortality. What did he mean? Of what is the Holy Spirit in our hearts and earnest or pledge? Is it a proof or assurance that we have immortal souls that will live on when the body is dead? Is that what Paul meant? No. The apostle makes it abundantly clear that the Spirit is a pledge of the redemption of our bodies at the resurrection. “... ye were sealed with that holy Spirit of promise, which is the EARNEST of our inheritance until the redemption of the purchased possession, unto the praise of his glory.” Ephesians 1:13, 14.
dwell in you, he that raised up Christ from the dead shall also quicken your mortal bodies by his Spirit that dwelleth in you.” Romans 8:11. This verse provides undeniable proof that the indwelling Spirit is a guarantee that our mortal bodies will be quickened at the resurrection. Now let us take note that Paul used an argument that forever precludes the doctrine of the soul going to heaven at death. In one simple statement, Paul shattered the popular argument for natural immortality. He said, “we… do groan that mortality might be swallowed up of life.” 2 Corinthians 5:4. Obviously, mortality can only be swallowed up by immortality, or eternal life. Is this the passing of the soul from the mortal body at the hour of death? Let us look at it. What is there about man, according to the common view, which is mortal? The body. In addition, what is immortal? The soul. Assuming for a moment that this is true, then what happens at death? At death the body, which is mortal, does not become immortal, but loses all its life and crumbles back to dust in the grave. Moreover, the soul, which was immortal before, is no more than immortal afterwards. Is there any “swallowing up of mortality by life” here? Just the reverse! Mortality, or the mortal part, is swallowed up by death! There is not as much life afterward as there was before, because after death only the soul lives, while the body which was alive before, is now dead. That view is in contradiction to what the Word of God actually says. We must reject it. Paul knew the Corinthians would not be confused by his language in 2 Corinthians 5 about mortality being swallowed up by immortality, because he had already written his first epistle to them explaining when that immortality would be put on. “… in the twinkling of an eye, at the last trump… this mortal must put on immortality. THEN shall be brought to pass the saying that is written, Death is swallowed up in victory.” 1 Corinthians 15:52-54. When would death or mortality be “swallowed up?” “THEN,” Paul said. When is THEN? “In the twinkling of an eye, at the last trump.” How can anyone stumble over the plain language of these verses? Nevertheless, he hastened to express confidence, as we have just pointed out, in the certainty of a resurrection when death would be swallowed up in victory (1 Corinthians 15:54). In either case, whether by translation or resurrection, he would be “clothed upon” with the immortal body. Either mortality would be “swallowed up” by being translated or death would be “swallowed up” by being resurrected. Paul does not linger over the “unclothed” state, because his hopes rested in the new body to be received at Christ's coming. He could not be “forever with the Lord” until that change took place “in the twinkling of an eye.” The interim sleep of death in the grave held no appeal for Paul, since it would seem but a fractional second of utter oblivion to the one who died. Looking beyond the uninviting nakedness of death to the land of life, Paul ruled out any possibility of a state between death and the resurrection when disembodied spirits could be present with the Lord. The apostle makes one other point in 2 Corinthians 5 that destroys the idea of a disembodied soul. In verse 5, he affirms that God “hath wrought us for the selfsame thing.” What thing? For what purpose had God made man? Paul answers that we might enjoy a state of being in which “mortality is swallowed up of life.” Is that condition the separate existence of an immortal soul? Impossible! Because if man had not sinned, he would have reached that state without seeing death. God’s purpose in making man would have been realized without death taking place, and the idea of an immortal soul would never have existed. Surely no one could believe that God “wrought us” for the “selfsame” purpose of sinning, dying and leaving the body in some invisible soul form. “For the earnest expectation of the creature waiteth for the manifestation of the sons of God.” Romans 8:19. What was that manifestation when the sons of God would be revealed? Verse 23 answers, “… we ourselves groan within ourselves, waiting for the adoption, to wit, the redemption of our body.” Paul’s earnest expectation and hope was for the time when his body would be redeemed. He did not say one word in Philippians 1:20-24 about the TIME he would be with the Lord. Some have attempted to interpret this text as though Paul said he wanted to depart and be with Christ immediately, but the word immediately is not in the scripture. In these verses, Paul does not specifically state WHEN he will be with the Lord. He only states his “earnest expectation” to be there. We have found from other scriptures that his expectation centered on the resurrection or translation of the body. Other passages further clarify without any equivocation when the great apostle expected to be with Christ. Paul had two conditions in view: to live or to die. Between these two, he was in a strait. The cause of God on earth drew him here, but he was weary from beatings, stonings, and bodily suffering. He almost felt that death would be desirable over the struggle of living. So evenly balanced were the influences drawing him in both directions that he hardly knew which course he preferred. Nevertheless, he said it was more needful for the church that he remain here to give them the benefit of his counsel and labor. Please note the significance of that word “SO.” It means “in this way,” “in this manner,” “by this means.” “SO,” in this manner, by this means, “shall we ever be with the Lord.” By describing, without any limitation, the way and means by which we go to be with the Lord, Paul precludes every other means. If there is any other way of getting to be with the Lord, then Paul’s language is a stupendous falsehood. If we go to be with the Lord by means of our immortal spirit when we die, then we do not go to be with Him by means of the visible coming of Jesus, the resurrection of the dead and the change of the living. Then Paul’s words would not be true. There is no possible way of avoiding this conclusion, except by claiming that the descent of the Lord from heaven, the mighty shout, the trumpet, the resurrection of the dead, and the change of the living, ALL TAKE PLACE WHEN A PERSON DIES—a position too absurd to be considered. Since Paul himself so carefully defines the manner of going to be with the Lord, why should man try to interpret Philippians 1:23 to mean something contrary to the writer’s own explanation? As we have just noted from 1 Thessalonians 4:16,17, Paul knew of only two ways to be with the Lord—by translation or resurrection. He expressed the hope that “Christ shall be magnified in my body, whether it be by life, or by death.” Paul tied life and death to a physical body, not some soul or spirit. The alternatives that drew him were either “to live” or “to die.” He was “in a strait” between these two. If he lived, Christ would be magnified, and if he died a martyr’s death, the cause of Christ would be magnified. It would be “gain” either way, both for him and for Christ. But after considering the two alternatives, upon which he could not make up his mind (to live or to die), Paul is suddenly struck with a third choice, which he quickly declares to be “far better” than the other two. He described it as “having a desire to depart and to be with the Lord, which is far better.” Better than what? Clearly, than either of the two he had just mentioned (living or dying). Again, we are reminded of Paul’s overwhelming desire to be translated without passing through the “unclothed” state of death. That was his deepest desire. Once more, we are constrained to ask: When did Paul expect this translation to take place? Moreover, when did he anticipate the change from mortality to immortality? He answers: “when Christ, who is our life, shall appear, THEN shall ye also appear with him in glory.” Colossians 3:4. When is THEN? At His second Coming. Have these appeared with Him in glory already? No. It will happen THEN, when He shall appear. John agrees with Paul, “But we know that, WHEN HE SHALL APPEAR, we shall be like him, for we shall see him as he is.” 1 John 3:2. Think for a moment about the implications of that statement. In the clearest possible language, Paul not only explains but also emphasizes that his reward will be given at the coming of Christ. Even though his departure in death was “at hand,” he did not expect to be with Christ immediately. He expected it “henceforth.” The crown of immortality was “laid up for me,” he said. He would receive it “in that day” with others who would “love his appearing.” Surely, those of us living today should anticipate that same glorious appearing when we too shall receive, with Paul, the crown of righteousness, which fadeth not away.